Last week (September 17, 2015), the US Federal Reserve Bank took the sensible decision to leave the US policy interest rate unchanged. Nine of the ten Federal Open Market Committee (FOMC) voted accordingly. One dissenter wanted rates to rise by 25 basis points. The central bank made the correct decision, even if you might like to question their reasoning. The decision has not pleased the financial markets who have been baying under the moon for months if not years for interest rates to return to higher and more stable levels. There is no surprise in that. They make more profits under those conditions and when there are low rates and higher uncertainty about their direction (and adjustment speed), profits come less easily. Further, they long for what they call “normal levels” of interest rates despite the fact that reality changed with the GFC and we now know that monetary policy is relatively ineffective as a policy tool for controlling or influencing aggregate spending. And it is typical that they ignore the millions of people who remain idle in one way or another and are enduring flat real wages and rising poverty rates. There is no old “normal’ now. Things have changed. I clearly agreed with the Federal Reserve Bank’s decision. In August I outlined why the – US Federal Reserve should not increase interest rates. Those views remain current. 1. “economic activity is expanding at a moderate pace … [and] … net exports have been soft”. 4. “Recent global economic and financial developments may restrain economic activity somewhat and … put further downward pressure on inflation”. So the Federal Reserve believes there is a deflationary bias facing the US economy and that employment is still below the level that it deems to be consistent with the inflationary threshold. It also believes, by implication, that the low interest rates are ‘accommodating’ (meaning expansionary in terms of total spending and economic activity) and an increase in interest rates would be a contractionary move. It is highly debatable whether interest rates have much impact on total spending given that they have distributional effects on creditors and borrowers. Those who hold interest-rate sensitive assets (creditors and fixed income recipients) gain when interest rates rise but borrowers clearly lose. It is likely that the borrowers have a higher propensity to consume than creditors. But there is conflicting empirical evidence about all this. Suffice to say that the near zero interest rates have not triggered a spending free for all which suggests that total spending is not as sensitive to changes in rates as the mainstream economists might believe. This is why Modern Monetary Theory (MMT) proponents put the emphasis on fiscal policy. An extra dollar of government spending goes straight into the sales books of firms if the government places orders directly with suppliers. If they hand the dollar to individuals (cash transfer), a fair proportion will be spent, given some of each dollar will be saved. The second- and higher-round effects of the initial stimulus (as firms hire more workers who then spend their incomes elsewhere) increase the economic gains of the initial stimulus. Anyway, this long-awaited decision generated an almost mass-wailing from the mainstream economists who have been lobbying, largely through their media mouthpieces (financial journalists) for months, if not years, for the central bank to increase rates. Wall Street bankers, lobbyists, and the rest of them have been regularly claiming that disaster would strike soon if rates were not increased. The soon is relative of course – the same cohort predicted catastrophe would soon strike Japan in the mid-1990s unless it dramatically cut its fiscal deficit and the Bank of Japan increased rates. Soon – just gets pushed out as one set of predictions fail and the memory banks of these dullards go blank (no feedback on their continual errors) and they line up their next set of doomsday predictions. And on it goes – soon! There was an article in the Financial Times (September 19, 2015) – The US Federal Reserve has got it wrong – by one Andrew Sentance, who is works for a global private management consulting firm and was a former member of the Bank of England’s Monetary Policy Committee. Sentance’s history on the Bank of England’s MPC between 2006 and 2011 is rather bleak. He continually demanded the Bank raise interest rates because he claimed the low interest rate environment would fuel inflation. The arguments that I made from the middle of 2010 onwards that policy stimulus should be reduced were rejected by the majority of the Committee, which prefers to believe its own model of how the economy should work rather than observing how it is actually behaving … An independent Central Bank is meant to safeguard price stability, not pursue policies which drive high inflation … The Bank of England has allowed inflationary drift to set in. I thought this graph from the British Office of National Statistics (ONS) from its latest publication – Consumer Price Inflation, August 2015 – might help us decide whether Andrew Sentance’s judgement is worth respecting. 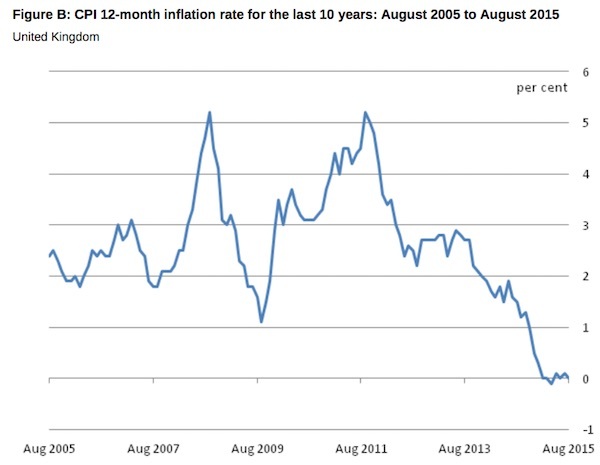 It shows annual inflation (CPI-based) in the UK for the last 10 years. Sentance confused a temporary spike in inflation in the UK with the underlying trend which was clearly downwards. The Bank of England hasn’t altered its policy stance over this period. And inflation has dropped to its now zero level. He is still demanding the Bank increase rates to head off inflation! Go figure. But his arguments in relation to the US Federal Reserve decision are representative of this squawking cohort of wannabees. Last week (September 17, 2015), the US Federal Reserve Bank took the sensible decision to leave the US policy interest rate unchanged. Nine of the ten Federal Open Market Committee (FOMC) voted accordingly. One dissenter wanted rates to rise by 25 basis points. The US Federal Reserve decided not to raise the key policy rate in the US this week. That would be an understandable decision if rates were at or close to a normal level. But they are not. Interest rates of 0.5 per cent in the UK and 0-0.25 per cent in the US are the lowest recorded levels in history. Seven years into a recovery, central bankers need to explain why the interest rate playing field is still so heavily tilted to borrowers. Noting that credit growth in both the US and UK is stable and below the levels common in the period prior to the crisis when interest rates were much higher. The US Federal Reserve’s – Financial Accounts of the United States – Second Quarter 2015 – shows that both mortgage, consumer and corporate credit growth is relatively stable. The Bank of England’s – Credit Conditions Review 2015 Q2 – shows that “mortgage approvals for house purchase and remortgaging remain much lower than in the years prior to the financial crisis” and that consumer credit is higher than it was last year but still relatively stable. UK corporate borrowing has “been negative for much of the period since the financial crisis” but has increased slightly in recent months. There is no breakout in either consumer or corporate borrowing in the UK. But having said that the main objection I have to this common view presented in this case by Sentence is the use of the term “normal level”. What exactly does that mean? Some prior average level? 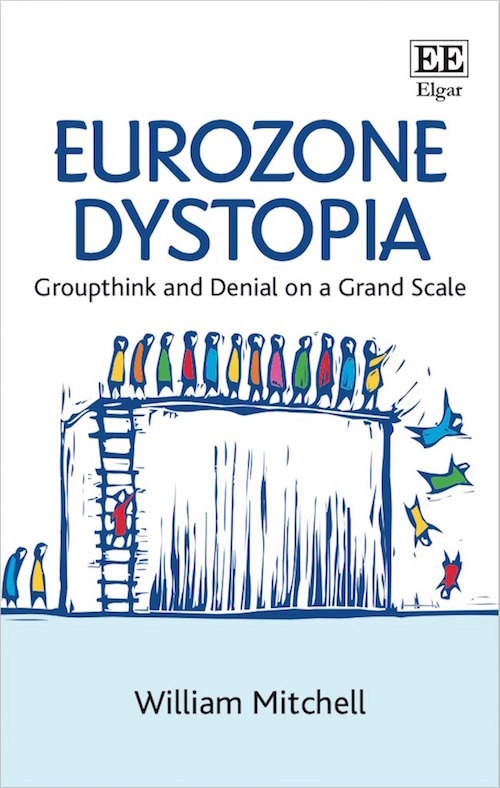 Reality changed in 2008 when the dynamics that had been set in place for some years by government and central bank policy built up and exploded. That reality destroyed the “normal” that Sentance might pine for. We now know that monetary policy is a relatively ineffective tool for stabilising the spending cycle, which means that previous ‘normalities’ were probably not well conceived anyway, given they were typically associated with passive fiscal policy (bias towards surplus) and elevated levels of labour underutilisation and well below historical levels of real economic growth. How is it normal that millions of workers are still unemployed or otherwise underutilised (including out of the labour force as the participation rate has declined)? How it is normal that Europe, a major trading partner of the US is still mired in stagnant growth and could fall back into recession on the back of the Chinese slowdown? Our times are anything but the previous “normal”. Sentance also thinks the pressure on central banks to keep interest rates low poses questions of political interference. … how independent are central banks? Since the 1990s, the Fed and the Bank of England have pursued policies similar to the ones any well-meaning government official would have chosen. They have cut interest rates very readily, but when they have raised them (in 1994-5 and 2005-7) they have been behind the curve. Independent central banks were established precisely to avoid this “behind the curve” interest rate policy. But it has not worked. Once again, they are at serious risk of lagging behind in their interest rate decisions as the major western economies climb out of the post-crisis recession. What does “behind the curve” mean when inflation is around zero and well below the policy target rates stated by each of the central banks in question. There is no stable “curve” that a central bank should go down and up according to their assessments of the economy and the monetary aggregates. … it is possible that the monetary status quo ante may not be fully restored. If global real interest rates are persistently lower, central banks may then need to think imaginatively about how to deal on a more durable basis with the technological constraint imposed by the zero lower bound on interest rates. That may require a rethink, a fairly fundamental one, of a number of current central bank practices. He went on to articulate a view that the “the crisis alone” did not “cause” the low interest rates but, rather, their “deep roots in fact appear to predate the crisis”. Which bears on Sentance’s view of ‘normality’. Willem Buiter and Ebrahim Rahbari, in Citbank’s – Global Economics Review – (April 2, 2015) – argued that there are now structural reasons relating to cash that would maintain a zero interest rate environment even when economies resume trend growth rates. You can read their analysis if you are interested. Haldane builds on their analysis and others to argue that real interest rates (the difference between the interest rate and inflation) have been “in secular decline” for the last three decades. With low inflation the norm now (as opposed to when interest rates were at Sentance’s “normal levels”) and real interest rates around zero or negative, this means that nominal interest rates have very little “policy room” in which to move. There is now a new “normal” if you like. And any perceived adjustment “curve” is likely to be very different now. The third problem is that central bankers appear to lack a clear strategy for monetary policy. Their implicit strategy is that interest rates will remain at current excessively low levels — until sufficient evidence accumulates to raise them. But a more realistic approach to keeping monetary policy on a steady and neutral course would involve a gradual rise in interest rates over the next few years. Inflation in the UK and the US is zero or near zero. Long-term inflationary expectations, which might provide a guide to the future course of inflation are similarly low and falling slightly. There are still substantial output gaps as evidenced by the low wage pressure and the large pools of underemployment, unemployment and low participation rates (particularly in the US). Hoping for some inflationary spark in the future and then invoking policy changes now doesn’t seem to be a sensible course of action. Which leads me to what I think is the real reason these characters have been calling for higher rates. The discussion of UK and US monetary policy is taking place on the basis of a false premise — that we can maintain near-zero official rates indefinitely — and that this would somehow be a satisfactory basis for economic growth over the medium term. I do not believe that, and I do not meet many people in the business and financial world who do either. If they do have a view about long-term near-zero interest rates, it is that this is likely to drag the UK and/or the US into a low growth equilibrium like Japan. That would be a major policy failure for the leading western economies. First, previously he was railing against keeping excessive stimulatory incentives to borrowers for too long and believing this would be inflationary. 1. Interest rates are very low and the economy is growing. 2. Borrowers have an incentive to borrow up big at these low rates. 3. The resulting spending will push too much demand into the economy and cause inflation. So, what model would we use to conclude that these low interest rates would actually do the opposite – create a Japan-like situation with relatively low growth and deflation? You can see his inconsistency escapes him. But moreover note that he is channelling the views of his mates “in the business and financial world” who are all shouting for higher interest rates. You don’t hear too many workers or trade unions calling for the central banks to hike interest rates and push up the cost of servicing mortgages. Last week, Wall Street had a tantrum when the Federal Reserve kept rates on hold. The following graph shows the sell-off in the sharemarkets that started after September 17, 2015. First, the investment banks and other commercial banks want higher rates because their net interest margins rise – more profit! Second, the big Wall Street investment banks – the diversified hedge funds – like to be able to push the markets around in their favour. The low interest rate environment and the uncertainty about when that will change (if it will) means it has been harder for these funds to manipulate the market in their favour. I will write another blog another day analysing how all that works. There was no economic reason for the US central bank to raise interest rates. Given its own logic it would have been an inconsistent decision. The squawk-squad calling for a return to ‘normality’ really want a return to the conditions where they could make more profits more easily. Their interests have nothing to do with welfare of the vast majority of us. I note that on this day (September 23, 1999), Long-Term Capital Management was handed over the vultures – the lessons were not learned. Banks have certainly pushed for increased rates.But Is bank profitability increased with higher interest rates? Interesting look at statistical evidence. Thanks Bill. I too read that article and a number if others all displaying chronic groupthink on the fact that interest rates just need to rise. There didn’t seem to be any logic or facts behind the assertion other than they’re too low and not nor do whatever that means. Why they would want to raise rates with no inflation doesn’t make sense even if not for MMT reasons. Looking at commenters on other articles it seems to purely be to do with profits being harder when the interest rates aren’t riding or moving in general in the financial industry. Sickening really that people must suffer for their profits. Against usury but it is pretty clear during the current robbery cycle The Fed and other CBs are using low interest rates to seize physical assets for their buddies. Indeed much of the credit given out is vectored toward just one Irish oligarch. This is the deflation beneficial towards people with access to preferential credit and or very large stocks of money. This is not the deflation for all as envisaged by social credit activists. Ireland is turning back into its 19th form where most of the land rent is directed toward absentee landlords. This is very much part of the plan. “If they hand the dollar to individuals (cash transfer), a fair portion will be spent, given some of each dollar will be saved.” I don’t think saving is a luxury many in the US have today; paying down personal debt would seem to be their immediate priority. It might actually be the case that it is the bond markets (specifically PIMCO) that want higher rates. PIMCO’s Andrew Balls (Ed Balls brother) “predicted” that central banks would raise their rates to a new lower “normal”. After this the central banks all started talking about a “new normal” and a “new neutral”. They are clearly being guided by the bond markets. Bill, like most economists, includes repayment of debt under the heading of saving. When he says saving, he is automatically including repayment of debt. Opportunity for the capitalists is almost unlimited given restrictions on capital movements have been lifted. We are now dealing with one bank to rule them all. These guys can give instructions to deflate certain banking jurisdictions such as Ireland and then buy assets on the cheap with outside credit at low interest rates. Subsequently inflate it beyond the carrying capacity of the conduit people and then dump – a very old banking technique but the sheer scale of current banking system is awesome to witness. The banking architecture we have now is the ultimate buddy system of people with access to preferential credit. Thanks for that Charles. I suspected that might be the case. I would be interested in hearing the accepted reasoning behind that. I suppose there is more to it than the arbitrary a dollar not spent is a dollar saved. I can see some basis for arguing it amounts to saving future income, but then you could also view it as spending in some sense? does not finance capital borrow for speculation as well as lend for interest? The lower the interest ,the higher the profits on leveraged speculation. real resources and low interest must aid such accumulation. Just a hunch. Never looked at this in any detail. You have referred to Mr Andrew Sentance. His correct name is Andrew “Death” Sentance. Leaving out his middle name could confuse some readers particularly from the UK. The banks make less money? They want interest rates raised? I don’t think so. Warren Mosler (haven’t checked lately though) thinks that low interest rates harm the economy and ordinary citizens … it’s also a tremendous distortion to evaluating risk.